Restore and protect all wall surfaces with a specialized epoxy coating designed to withstand chemical spills, water and other hostile agents. Easy to clean—creates a thick, attractive, sanitary wall surface that protects against graffiti and wear. Easy to apply by roller. Fast drying and creates a pleasing satin finish. Pre-measured components in a 1 gal kit for easy application. 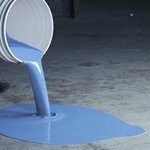 Components include: 3/4 gal Part A (resin), 1/4 gal Part B (hardener). Tigerwall™ is approved for shipping to all 50 states by ground or air.